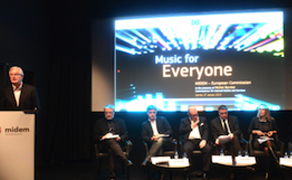 CANNES, France (VIP NEWS) — Today’s Music for Everyone panel session at midem was notable for the appearance of Michel Barnier, the European Commissioner for internal market and services, notably in charge of copyright. The commissioner was in town to espouse his commitment to relieving the frustrations of digital music consumers, entrepreneurs and artists/songwriters at the current complexities of the market. “Europeans are often frustrated at not being able to access online the diversity of content offered in other member states, even though they are prepared to pay for it,” he said. Barnier won warm applause from the industry crowd by stressing that reforming copyright complexities will not trump a commitment to tackling piracy, though. “Copyright is an essential driver in the creative process, but a right which cannot be respected is of little use,” he said, referring specifically to the current pet hate for music rightsholders: piracy sites funded by advertising, often from well-known brands. “Is it acceptable to tolerate advertising revenues being gobbled up by a service provider who foster the free sharing of illegal music files?” he said. Songwriter and journalist Helienne Lindvall was part of the panel responding to Barnier’s speech, and she noted that while her native Sweden is currently seeing a growth in recorded music revenues thanks to booming streaming subscriptions, this carrot has been complemented by a stick of legislation. U2 and PJ Harvey manager Paul McGuinness was his usual quoteworthy self in the session, making the point that when the industry talks about the difficulty digital services have getting licences, it doesn’t always acknowledge the fact that there may be good reasons for this difficulty. “When we talk about the availability of licences not being sufficient, very often we’re using that as a euphemism. Very often the people seeking licences suffer from let’s call it an ‘integrity deficit’. That’s the reason they don’t get licences, and they should not,” he said. But the juiciest part of the session was when the conversation turned to Google, which has something of a love-hate relationship with the music industry and creators across various elements of its business. “I don’t want to engage in Google-bashing, but there is a sense of unease across Europe, across the world about Google,” said McGuinness, referring to the internet company’s promises to downgrade piracy sites in its search-engine rankings. He continued: “Google have brought so much to civilisation in terms of spreading knowledge and informing the world. I know they’re ingenious, we all know they’re ingenious. But they are making money from directing people to piracy sites,” he said. Deezer CEO Axel Dauchez talked about Google, too, but for a different reason: the unfair competition he sees the company providing for European digital music services like his own. Something Dauchez described as a “cancer” for the industry. Dauchez said competition from Google and Apple in particular risks stymying the growth of European services.